Named in honor of Albuquerque's pioneering aeronauts Maxie Anderson and Ben Abruzzo, the museum opened in 2005, and has since welcomed over one million visitors from across New Mexico, the United States, and around the world. The Anderson Abruzzo Albuquerque International Balloon Museum is home to one of the most complete collections of artifacts, images, and stories from the world of ballooning. The Museum features new exhibits that explore the past, present, and future of ballooning, as well as subjects related to the science, engineering, and technology of lighter-than-air aviation and other innovative forms of flight. The Balloon Museum seeks to serve our audiences in unique, meaningful ways in order to sustain the relevance, popularity, and permanence of the museum, and we recognize the responsibilities that come from serving diverse audiences. Through our education programs and events, we strive to encourage learners to be critical thinkers in order to unlock knowledge and understanding now and in the future. 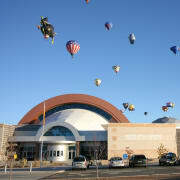 Would you recommend Anderson Abruzzo Albuquerque International Balloon Museum?